Getting your family excited about hanging up their coats and putting away their shoes is not an easy task. But with a custom designed mudroom from Beyond Storage in St. Louis, it is possible. 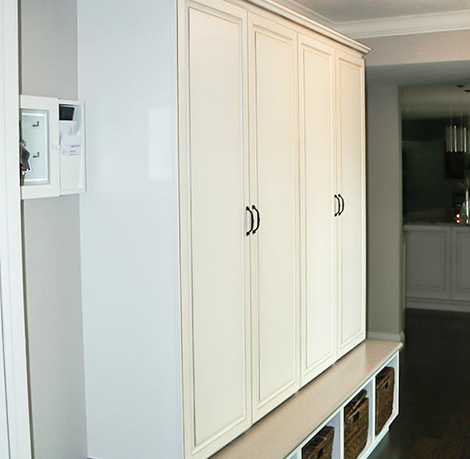 With our mudroom design and storage expertise, we can provide you with a solution that will keep you and your family more organized and a storage system that will make storing any belongings much easier. Created for ease of use and maximum organization, we utilize a combination of hanging features, cubbies, storage benches and cabinetry to consolidate the clutter and increase usable space. Plus, depending on your needs and daily lifestyle, you’ll be able to select from the accessories and features that we offer and find a storage system that meets your expectations. As a result, homeowners can enjoy their space more and worry less about organizing their home. Below is a full list of accessories and custom elements that can be added to your mudroom storage system. To see all the design possibilities that are available, take a look at our photo gallery of recently completed home organization projects below. Here you’ll be able to see solutions we’ve been able to provide to families and large households throughout the St. Louis area. At Beyond Storage we use hooks and knobs for coats and jackets along with cabinets, drawers, baskets and shelves for hats, backpacks, and shoes to ensure there's a home for every item. Our professionals install both smaller cubbies for gloves, lunchboxes and shoes and larger cubbies for coats, sporting equipment and backpacks as well as storage benches for excess space and increased functionality. Ready to embark on your next mudroom project? Fill out our contact form below to begin speaking with a design specialist from our team.